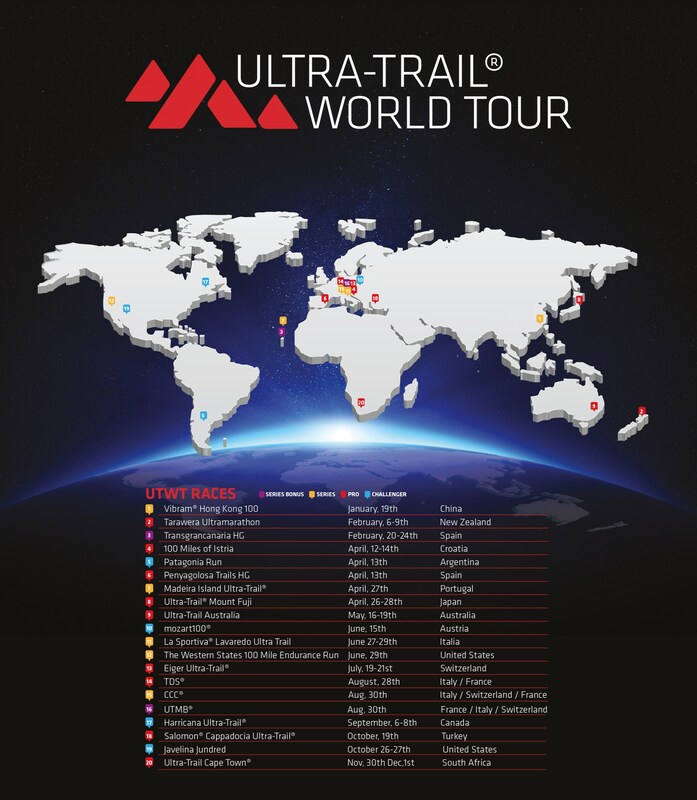 Created in 2014, the Ultra-Trail World Tour is a prestigious long-distance (more than 100 km) trail race-circuit, in diverse technical terrain and with different levels of difficulty. Conceived as an international circuit, it is a series of events which serve as a reference model in five continents. In the 2018 season it will be present in 18 countries all around the world. Held in collaboration with ITRA (International Trail Running Association), its steady growth is attributable to one of its main objectives: to ensure better geographical coverage and to improve access to the circuit. The finishers. From beginning to end, everyone is important and stars in their own sports stories which combine their self-demanding attitude, emotion, and the satisfaction of crossing the finish line. The elite runners. The Ultra-Trail World Tour allows the meeting of incredible runners. Champions who deserve fame and to be known for their performances; they are an authentic inspiration for runners all over the world! Ranking is open to all the runners. The races are classified into four categories with fixed scores based on the runner’s ranking. Completion of a minimum of two races is required to access the annual classification. The world ranking is produced taking into account the runner’s five best results within a period of three years. The Organization of the Penyagolosa Trails HG has decided to set up the QUARTZ Event program to protect your health and contribute to doping-free sport. This program is open to all participants. This program has neither the vocation nor the competence to replace anti-doping rules but aims to strengthen the medical supervision before and during the competition. QUARTZ Event program is carried out in collaboration with the International Trail Running Association (ITRA), Athletes For Transparency association (AFT) and Ultra Sports Science Foundation (USS); it is managed by a Health Commission solely composed of doctors. This Health Commission can take advice from experts of its choice and specifically give a consultative advice to the race direction on the medical condition of participants. This Health Commission can go as far as to suggest to the race direction that a participant should be excluded from competition for health reasons. Any medical history and/or pathology, in particular those which may increase risks during the practice of a sport. The use of regular treatments or medication during the 30 days prior to the start of the competition. Request or use of a substance or method subject to a Therapeutic Use Exemption (TUE). 2. Provide all urinary and/or blood and/or hair and/or salivary samples required from 30 days before the competition and up to 7 days after the competition. He/she also consents to the associated analysis of these samples, on the understanding that the costs for the sampling and analyses are covered directly by the Organization. 4. Accept to answer any meeting request on site or remotely (phone or videoconference) that the Health Commission may ask for in order to discuss their ability or not, to participate in the competition. 5. Accept the use of strictly anonymous data for research purposes. Each participant has a right of access, rectification and opposition to data concerning him. The Health Commission is the authority with which the participant can exercise this right. Penyagolosa Trails Sport HG joins the Ultra-Trail World Tour in 2017. In Spain there are two races in calendar: Transgrancanaria HG anc Penyagolosa Trails HG.